In episode 15, Min Suk faces multiple struggles including doing what he wants to do compared to what his brother wishes to achieve as well as fighting for Grandpa’s love that is always shown towards Hyung Suk. It’s through episode 15 that we witness Min Suk’s maturity and growth because of those struggles (YAY FOR STRUGGLES!). From where we left off in episode 14, Min Suk enters a hotel room to meet up with the CEO of Pavo Asia, a company that COMFO is planning to collaborate with in order to expand its business. Upon seeing the CEO of Pavo Asia, Min Suk introduces himself as Director Lee Hyung Suk of COMFO, but little does he know that the man he’s standing across from is the actual Lee Hyung Suk. It’s his brother! After exchanging hugs where Min Suk finally learns to accept that yes, it is his actual brother that he’s meeting with, Hyung Suk advises him to not tell anyone that they met – not even Team Leader Kim. He also asks for Min Suk to prepare the investment funds that COMFO will be using to invest on their collaboration with PAVO. Min Suk abides by his brother’s words and leaves the room. Later on at a meeting with President of COMFO and the other board members, Min Suk discusses about how the CEO of Pavo Asia would like COMFO to proceed with the investment funds as soon as possible. President, just like Pavo Asia, also wishes to do the same, but the board members are hesitant upon President’s wants. COMFO is short on funds and President has already sold his stocks and now they’re going to resort to their special reserve fund. It’s a dangerous move, but President remains stubborn. He plans to hold another meeting to talk about the funds with some shareholders and board members the next week and expects everyone else to be there. Director Yoo tries to inform his dad about Pavo and their suspicious intentions, but President doesn’t want to listen to his son. He doesn’t want to listen to anyone. He just wants to invest in Pavo as soon as possible for he thinks it’ll be beneficial for COMFO in the end. Director Yoo grows so annoyed and irritated he has no choice but to go to Germany himself. He asks his friend to buy him a ticket to Germany where he himself will investigate everything. Min Suk goes to visit his brother Hyung Suk who exposes to Min Suk how President of COMFO is connected to their biological father’s death. We find out that President and Min Suk’s dad were business partners. However, due to President’s greed to expand the business, he betrayed Min Suk’s dad and caused him to go bankrupt. Without any money or support left, Min Suk’s dad then chose to kill himself. Ever since their parents’ deaths, Hyung Suk traveled abroad to study and become successful, but along the way found himself greedy for power and revenge. He thought that signing to work with COMFO would be the best way to get his revenge, but found himself facing some difficulties along the way. Hyung Suk had left to go to Korea, but was suspected of murder when an acquaintance who was helping Hyung Suk on his plan died so he had to return to Germany. It didn’t help that around the time his friend had died, he had flown to Korea too. Hyung Suk was eventually released due to a lack of evidence, but was placed under German police surveillance for some time. That’s why he couldn’t contact Min Suk, but now that he’s in Korea and has reunited with this brother, he’s going to need his brother’s help to successfully achieve his revenge. Soo Young finds Grandpa waiting in front of a convenience store while hollering out Hyung Suk’s name so she eventually gets him home safely. Just when she’s about to leave she sees who she thinks is Min Suk so she pinches his cheeks and asks him how his meeting with his Hyung went, but it’s not Min Suk she’s talking to – it’s Hyung Suk! LOL. She’s so taken aback she can’t say anything so when Deok-hwan and Tae Suk also approach Hyung Suk and tease him, they are unaware that it’s Hyung Suk, not Min Suk, they’re fooling around with. Oh my god, this is too hilarious. It’s not until Min Suk approaches them while wearing his school uniform that they finally discover that they had been interacting with Hyung Suk the whole time. Hahaha. Too funny too funny. 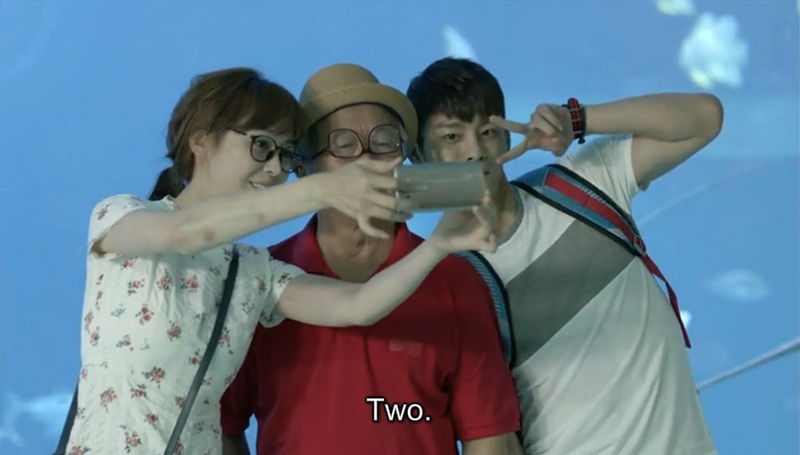 Min Suk leaves his two best friends to take care of Soo Young while he returns back home to reunite with his family. When Dad hears someone arriving at his house, he believes it’s just Min Suk so he acts like he normally does, but when he finds Hyung Suk standing across from him, he suddenly grows teary-eyed. Although Dad scolds Hyung Suk for disappearing this whole time, he’s just relieved to find his adopted son back home, safe and sound (aww, this is so touching). Hyung Suk also goes to see Grandpa although Grandpa’s busy sleeping and getting some rest. Dad encourages Hyung Suk to stay a little bit longer, but Hyung Suk can’t for he has some things to take care of. 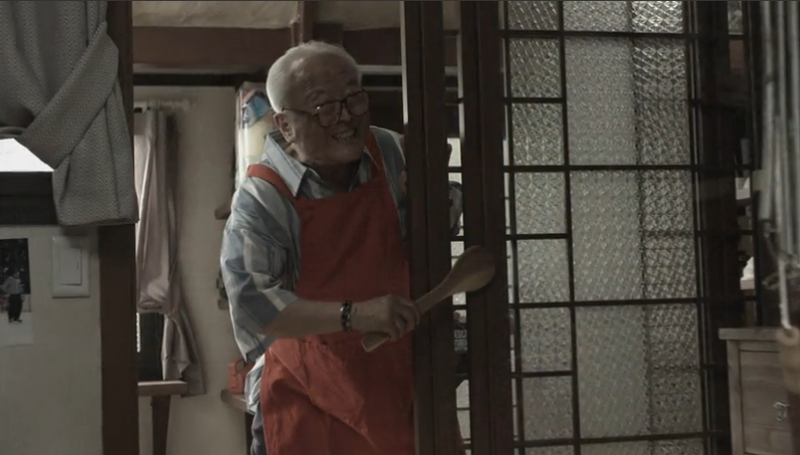 Just when he’s about to leave, Grandpa comes running out of the house yelling out Hyung Suk’s name. When he finds Hyung Suk, they hug each other and rejoice. Before leaving, Hyung Suk promises to take Grandpa to the aquarium in three days which excites Grandpa. Soo Young is still so affected by how she acted towards Hyung Suk she can’t seem to get a hold of herself. While eating at Tae Suk’s Chinese restaurant, she criticizes the food for tasting poorly, but grows even more agitated when she finds out that the food she’s criticizing is food Tae Suk’s mom made. The two best friends go on to name Soo Young as the icon of mistakes. Haha. While meeting with his brother, Min Suk requests for Hyung Suk to stop it with his revenge scheme. He doesn’t want to continue to play as Hyung Suk any longer. He doesn’t want to see COMFO go bankrupt over trying to get the investment funds. But Hyung Suk reminds him that they’re doing this for their father, not for anyone else. When Min Suk returns home that night, he glances at a picture of him and his family. While everyone else is excited over the COMFO and Pavo Asia collaboration, Min Suk and Soo Young are stressed and overwhelmed. Min Suk conveys his anger by shouting and yelling out loud only to find himself being mocked by Soo Young who is also repeating the same things that Min Suk is screaming. Hahaha. Min Suk asks Soo Young for a hug to feel better, but Soo Young’s ‘no physical contact’ rule is still intact. When he walks home that night, Min Suk comes across an excited Grandpa who can’t wait to go to the aquarium with Hyung Suk. The both of them visit Hyung Suk’s apartment only to find him no where to be seen so Min Suk leaves Hyung Suk a note before leaving, reminding him of the aquarium date he promised to go on with Grandpa. The next morning, Grandpa is happily packing some belongings and snacks in his backpack for the day to go to the aquarium with Hyung Suk has arrived. 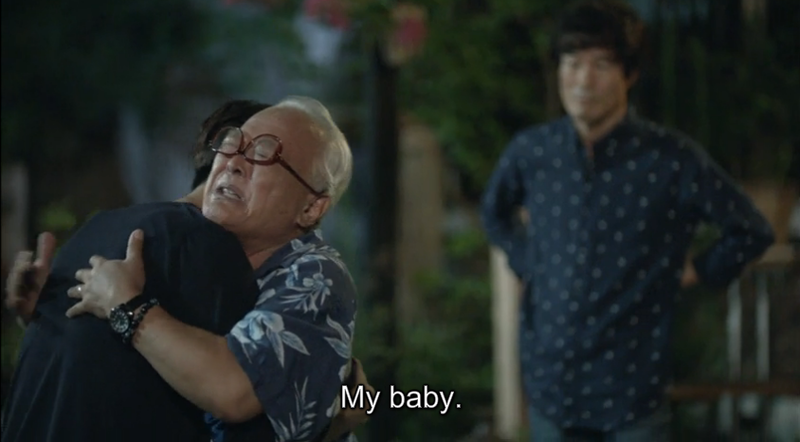 However, when Hyung Suk is no where to be found, Grandpa grows gloomy and starts weeping. No matter how many times Min Suk tries to get into contact with his older brother, he is unsuccessful every time. Just when Min Suk and Grandpa are hopeless, Min Suk is reminded of Pretty Unnie and it isn’t until Min Suk suggests going to the aquarium with Pretty Unnie that Grandpa grows happy again. Hehehe. So the three of them all head to the aquarium together. We find out that Grandpa and Dad had always been living with Min Suk and his family before his biological dad had passed away since Dad served as Min Suk’s real dad’s chauffeur (woah, I hope I didn’t make that sound too confusing, lol). For the rest of the visit, Soo Young and Grandpa continue to leave Min Suk out which makes him not only jealous but mad as well. Hehehe. He tries to make it clear to them that he’s mad, but Grandpa and Soo Young doesn’t take him seriously. They tickle him over and over again until he falls to the ground (AH HA! Now we know one of Min Suk’s weak spots! Haha). 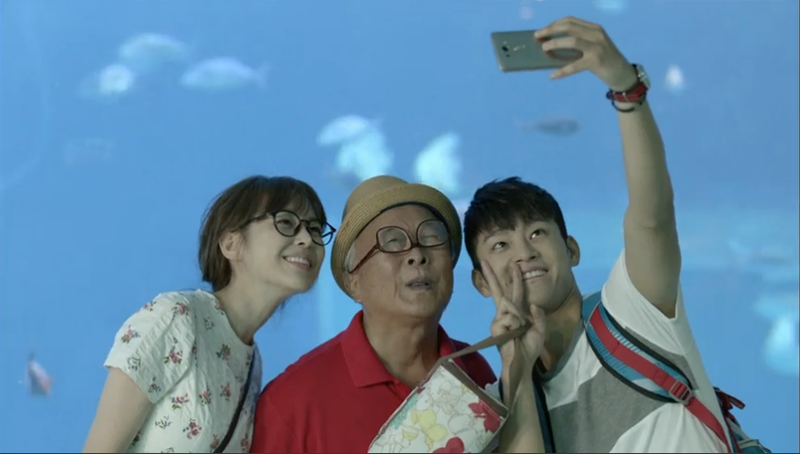 The aquarium date finally comes to an end so Soo Young bids farewell with Grandpa and Min Suk. While she returns home, Grandpa and Min Suk have a small talk with each other. Grandpa gives Min Suk a small peck on the cheeks before confessing that he loves Min Suk. Awww. He also adds that he’s going to marry Pretty Unnie which of course Min Suk forbids (because ya know, Soo Young is Min Suk’s). Grandpa grows sad and states that if he had told this to Hyung Suk, Hyung Suk would have been supportive and allowed Grandpa to marry Soo Young (ohhh, so now we get a little hint as to why Grandpa prefers Hyung Suk). Grandpa points out that Min Suk is a bit selfish unlike his older brother. Min Suk gets a phone call from Hyung Suk asking him to go to the meeting on Tuesday to vote in favor of the investment funds. 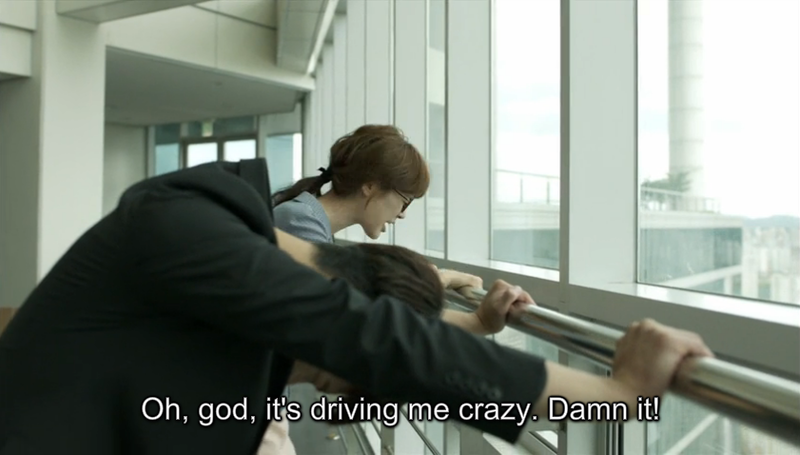 However, that is the last thing Min Suk is worried about. He brings up the topic of Hyung Suk not taking Grandpa to the aquarium, but Hyung Suk too is careless about that. Aggravated and frustrated, Min Suk argues with his brother. He doesn’t want to take part in this revenge scheme anymore. He doesn’t want to see COMFO employees go unemployed overnight and he doesn’t want to see his brother’s life get ruined. Min Suk tries to remind his brother about Grandpa again, but instead is reminded by his brother about the meeting on Tuesday. *sigh* Hyung Suk, what are you doing?! The next morning, while Dad and Min Suk are eating breakfast, Grandpa is still asleep. They assume that it’s just because he’s exhausted, but when they find him laying restlessly on the sofa unresponsive to their callings, they panic. However, Grandpa eventually awakens and joins them for breakfast. Once again, the only person Grandpa can think about is Hyung Suk. He talks about saving some food for Hyung Suk so Hyung Suk can eat it when he comes home again. Min Suk is hurt, but plays it off by joking around with Grandpa. It’s Monday which means another day of work. The actual Hyung Suk arrives at COMFO to receive the same treatment from the Retail Team that Min Suk usually receives from them (you know, the usual compliments and greetings) which annoys Hyung Suk to no end. The reason as to why Hyung Suk had come to COMFO was because the meeting that was originally on Tuesday had been moved to Monday. Soo Young calls Min Suk who’s still at school to inform him that his brother is at COMFO to attend the investment fund meeting so Min Suk sprints to get to COMFO as fast as he can. Meanwhile, Director Yoo also learns that the meeting had been moved to Monday instead of on Tuesday. While hurrying over to COMFO, he leaves his dad a message on his phone asking him to stop the meeting because it’s all part of Hyung Suk’s revenge scheme. If his dad decides to send the investment funds, COMFO will go bankrupt. But it’s hopeless as President of COMFO isn’t carrying his phone with him at the meeting. The meeting eventually takes place and so does the voting for the investment funds. When the voting is finished, Managing Director Han reads out loud the results and it is announced that 15 out of the 22 attendees at the meeting has approved of letting the special reserve fund be used on the COMFO and Pavo Asia collaboration. Hyung Suk and President congratulate each other before Hyung Suk leaves the room feeling accomplished and one step closer to achieving his revenge. When Min Suk arrives at COMFO, he finds Hyung Suk leaving the COMFO building so they encounter each other along the way. However, they are not alone for President of COMFO and Managing Director Nam also joins them and soon enough Director Yoo (AAHHHHHHH!). When President asks for a clarification upon seeing the twins, Hyung Suk reveals to President of COMFO his identity and confesses that he is the son of Lee Jung Soo whom President had killed. He also tells President that he is finished – that it’s all done for him. 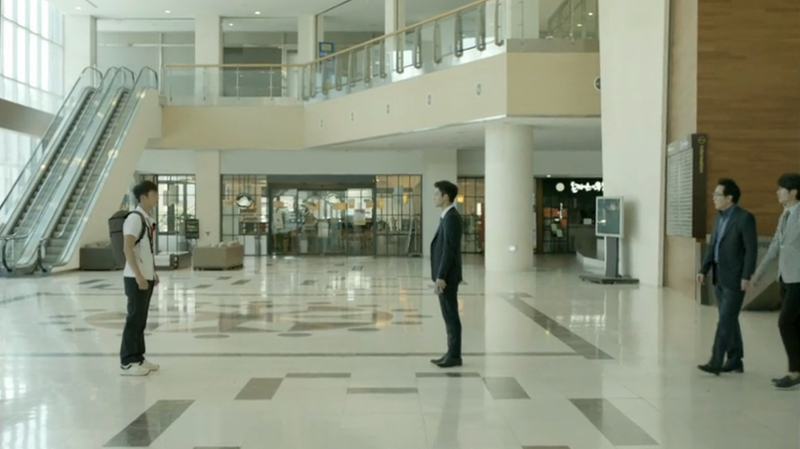 President grows shocked and almost falls over while Hyung Suk leaves. Over at the Retail Team office, the members themselves are trying to piece everything together. They figure out that the person they had thought was Director Lee Hyung Suk the whole time was really not Lee Hyung Suk and just a high schooler and that Lee Hyung Suk had created Pavo Asia just so he could get his revenge on President. Not only that, they also discover that Director Yoo is President of COMFO’s extramarital son (DANG, TWO SECRETS AT A TIME!). When Team Leader Kim joins them to ask them what’s going on, they all explain to him about how Min Suk’s a high schooler which causes Team Leader Kim to faint for about 5 seconds. Haha. Omg, his reaction is gold! Director Yoo is with his dad who’s at the hospital, but reflects back upon the conversation he had with Min Suk before visiting his father. He pleads Min Suk to talk things over with his brother and also apologizes on behalf of his dad for his dad’s actions. Although Min Suk had originally felt like there was nothing he could do about his brother, he is motivated to talk things over with Hyung Suk after speaking with Director Yoo. Meanwhile, Dad is at home cooking, but heads out to the store to go buy some ingredients that he had forgotten to buy. When Dad leaves, Grandpa wakes up from his nap and also leaves the house to go search for Hyung Suk. 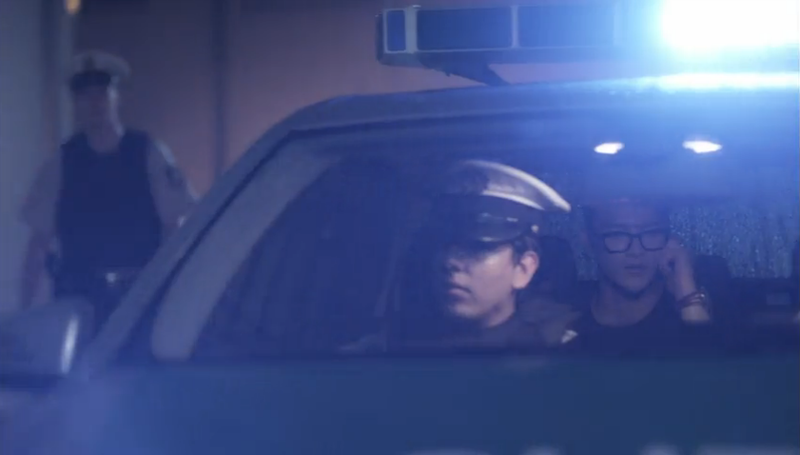 Grandpa crosses the streets carelessly while shouting out Hyung Suk’s name and goes around calling Hyung Suk. 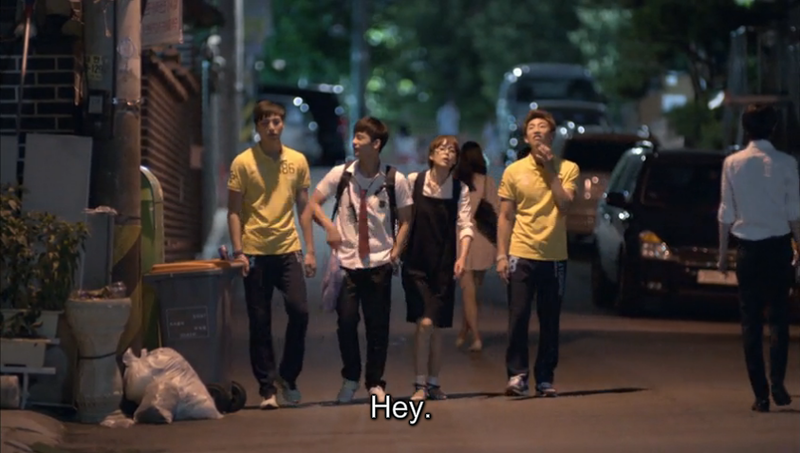 Meanwhile, Min Suk, Dad, and eventually Soo Young all go on a search to find Grandpa. The search goes on for a while until Min Suk contacts his dad to meet him up at a certain place that Min Suk believes Grandpa could be at. They all find him at Hyung Suk’s office-tel sleeping after he had been constantly yelling out Hyung Suk’s name multiple times over and over again. Min Suk tries to wake Grandpa up repeatedly, but Grandpa doesn’t move or respond (OMFG. DONT’ DO THIS TO ME NOW KING OF HIGH SCHOOL. DO NOT DO THIS TO ME. DON’T YOU DARE DO THIS TO ME. NO NO NO NO NO). The nemo fish doll that Grandpa had been holding onto just so he could give it to Hyung Suk eventually falls from his arms while Grandpa’s head falls back. Min Suk starts to wail and weep at the sight of his weak and lifeless Grandpa who shows no signs of waking up. 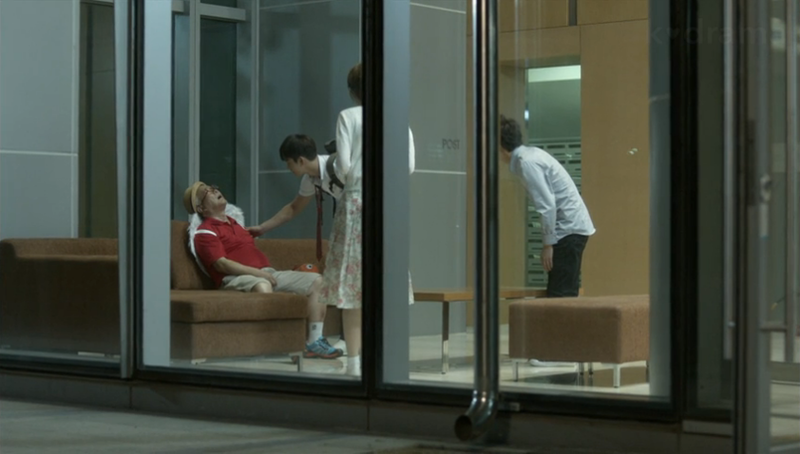 The episode ends with Grandpa sitting on the couch frozen and departed while Min Suk weeps for his grandpa to wake up. Why does the drama have to pull this on us two episodes before the end of the drama?! WHY!? WAE?! WHHHYYYYYYYY. WHY DOES GRANDPA HAVE TO DIE. I DON’T GET IT. IT WASN’T EVEN NECESSARY. I thought it was kind of suspicious how Grandpa received so much screen time in this episode. He usually only gets a few minutes of screen time, but in this episode, he was the center of attention and the focus. Episode 15 was all about Grandpa and revolved around him and although it was nice to see more Grandpa, I wished it hadn’t been at the expense of his death. I rather see 2 more episodes containing 5 minutes scenes with Grandpa than a whole episode of Grandpa and 2 remaining episodes dealing with his death. It’s just so sad. So sad. It’s not enough that Min Suk lost his parents, now he has also lost his grandpa. Why? I was glad to see Min Suk stand up for himself and for the COMFO employees and argue against his brother. Since he’s younger, he kind of has to listen to his brother, but his age doesn’t stop him from saying or doing what he wants. He’s following his heart and mind and I really like seeing Min Suk try to make his brother aware of the mistakes that he’s committing. I guess in a way it’s kind of ironic because Hyung Suk had asked Min Suk to step in for him for some amount of time, but over time, Min Suk has grown to adapting to this lifestyle and has come to appreciating and knowing his Retail Team members. It’s become a part of him now when Hyung Suk hadn’t expect it to. So now that Hyung Suk is asking him to help him on his revenge scheme, Min Suk doesn’t want to take part in it because he cares for COMFO even though he was just a fake director the whole time. Something that was just supposed to be a simple task turned out to be something so much more meaningful and big, especially for Min Suk. Because of this, he’s not willing to give up certain things just to satisfy his brother. In this episode, Min Suk is really wise and whereas one would expect Hyung Suk to be correcting Min Suk’s doings, it’s the other way around which I really find interesting. I understand that Hyung Suk wants to get revenge on his father, but the points that Min Suk brought up were reasonable and so on point. The one that got me the most was if this was something that their dad would want them to do. Getting revenge won’t necessarily get them anywhere nor will it bring their dad back to life and it’s sad that Hyung Suk is so blinded by this he doesn’t realize the danger he’s imposing on others. 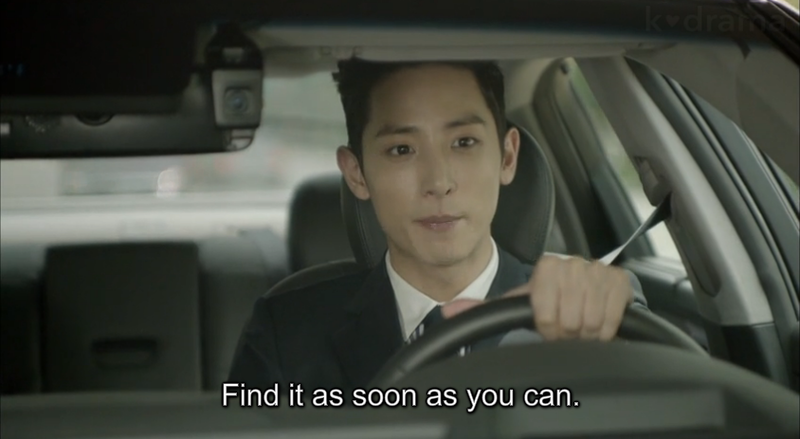 I commend Min Suk’s efforts to get his brother to realize what he’s doing and how he continues to try no matter what. I love the determination and persistence that Min Suk displayed in this episode. You can tell that he’s definitely changed after working as Director of COMFO. Although he is still childish at times (like how he doesn’t want Grandpa to marry Soo Young or to hold Soo Young’s hand, haha), the way he’s so reluctant to go with his brother’s revenge scheme indicates that he just wants to live a simple life. It indicates that he’s moved on while his brother is still stuck in the past. And sometimes letting go and moving on is the better choice. I’m also curious as to why Grandpa only shows concerns and care for Hyung Suk and none for Min Suk. I understood a little bit when Grandpa was pointing out Min Suk’s weakness which was his selfishness and inability to be supportive, but I wonder if there is something more than that. Did Min Suk do something to Grandpa when they were little that caused him to favor Hyung Suk more? Is it because Hyung Suk supports Grandpa that he likes Hyung Suk more? Or maybe it’s just because he’s been gone for quite some time that Grandpa really misses him? The way I see it, I think both sons are supportive of Grandpa and that they both care for him wholeheartedly. It’s sad to see Grandpa always talk about Hyung Suk, especially when Min Suk is right there in front of him too. I’m sure Min Suk is deeply hurt by the comments, but I commend him for not holding it seriously against Grandpa and for joking around with Grandpa about it. I just barely realized that there were no scenes of Yoo Ah in this episode which is quite surprising. She, just like Grandpa, usually gets a few minutes of screen time but she was no where to be seen in this episode. *sigh* I don’t know what this drama is trying to do. All I know though is that I’m really going to miss Grandpa. And him sneaking out of the house. And him spazzing over his chocopies and chocolates. And him always getting lost only to be found by Soo Young who he would always refer to as Pretty Unnie. Grandpa, although he wasn’t the main character in the drama, really served as a source of happiness and joy in this drama and now that he’s gone I don’t know whether I will still be able to enjoy this drama as much. Grandpa, I miss you already.